Handmade Holidays Garland Tutorial and BIG GIVEAWAY! These are quick to whip up for holiday decorating and gift giving. In fact, you won’t want to miss all the handmade gift ideas! I have joined over 100 bloggers to share some amazing homemade gift ideas, plus I get to be part of an amazing sewing giveaway too! Keep reading to enter! This machine is sew AMAZING! She is a gem and her name is Rachel. 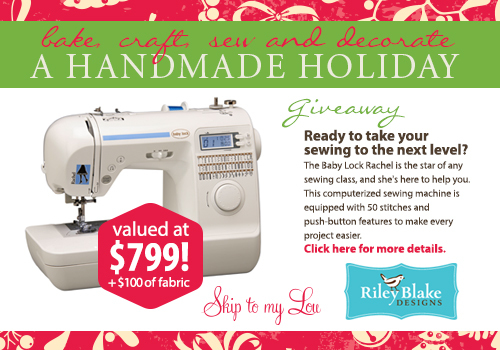 One lucky winner will receive this beautiful Baby Lock Sewing Machine ($799 Value) and $100 Worth of Fabric from Riley Blake Designs. Riley Blake Designs amazing fabrics include cottons, flannels, sparkle cottons, organic cotton, knits, and laminates in a range of designer and basic prints. I love their fabric and fantastic customer service!